Just when I think, "been there, done that" and "it's impossible for me to fall in-love with yet another doughnuts shop," Fany Gerson the owner of Dough makes me do exactly that, fall in-love with her charming shop and her artisanal doughnuts in the Flatiron district in Manhattan. The original Dough outpost is in Brooklyn. How is it even possible in this saturated doughnut market to set yourself apart?! Dough does exactly that. Going in, one, I was certain I would be familiar with the dough, two, I was also sure I would hate the Hibiscus one, if not have a major anaphylactic reaction to it first. Wait, I am allergic to lavender not hibiscus. Never mind number two! Dough doughnut is the child of an American doughnut and an Israeli one, if they were to be married and have soft and cottony doughnut babies. Though the doughnuts aren't mini, they are full size doughnuts. On Dough's website it says it was inspired by European and Latin American doughs. Hmmm to that. The hibiscus, Gerson's signature doughnut, was pure sophistication with the candied dry hibiscus garnish on top. The garnish had just a touch of tang but complemented the hibiscus glaze and the doughnut very much. While I have a mad crush on Dough doughnuts, I care for the vanilla glaze one over at the Doughnut Plant more. Speaking of which, I like the creme brûlée at Astro Doughnuts in DC over the one at the Doughnut Plant. While at Dough, go for the specialized flavors like the unique hibiscus one. The combinations are carefully thought through and the execution is a brilliant sensation of flavors and textures. My friend Jackie's, the Singing Chef, new favorite is the Cafe Au Lait. I haven't had a chance to try a variety of doughnuts at Dough. We were in NYC on our 28th year anniversary (July 12), mixing food with some walking and biking in Central Park and visiting a museum or two. 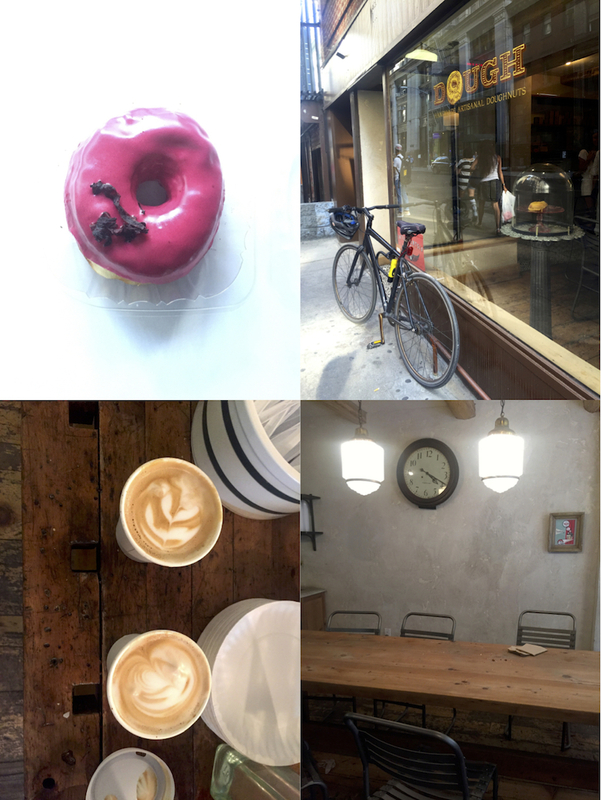 While Jonathan now trusts my food agenda, and enjoys our food explorations and discoveries very much, he isn't for the lack of a better term, a foodie at heart. Next time I'll go to Dough on a doughnut crawl with Jackie, but not before I start juicing! Tomorrow! I mean, can there ever be too many donuts?? This looks like a fantastic shop! Awww..happy anniversary to you and J! What a great accomplishment. You are such a great couple! Mazael Tov! And love Dough. Jackie is the best "food-tour guide". I had the hibiscus one and a couple others. It's a favorite place for us now, thanks to the Diva!! What else did you try this trip? These doughnuts look fabulous --- I mean, absolutely gorgeous!! Too bad we're nowhere near New York but I'll bookmark this for later use. 28th anniversary? Holy cow!! Congratulations!! Congrats on your anniversary! 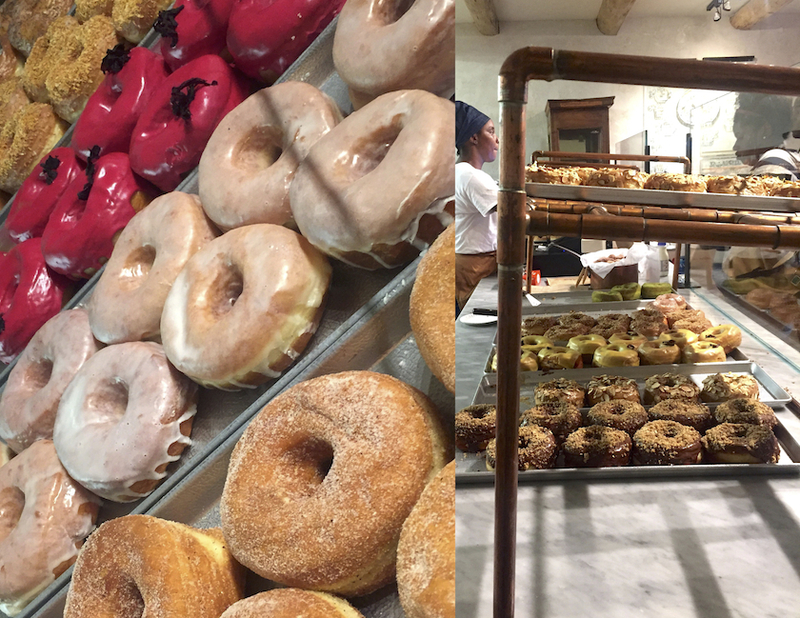 I think these incredible donuts are the perfect way to celebrate - eating your way through NYC! Mmmm, I want to try one of each. Anything Fany Gerson is gold in my book, this is on my to-visit list! Happy Anniversary :). How fun that you were in NYC for your anniversary. It's such a fantastic place for any kind of celebration! Dough is now going on my list of places to visit the next time I'm in NYC. I'm intrigued by the hibiscus one. hahaha A doughnut crawl for me would be just that...I'd eat so many that I'd be crawling home. Happy belated Anniversary! I have got to have one of those hibiscus doughnuts. Swoonworthy for sure. Happy Anniv! And hello a hibiscus doughnut - totally swoonworthy. Okay this has to go on my list for my trip to NY this fall. I cannot wait. Squee. I wish there were more amazing donut shops where I live. These look soooooooo good! Sounds delicious. Your description of this douhgnut shop makes me want to visit the next time I am in New York. I need to get me some!! I must plan a NYC "eat this" tour this summer! Just yesterday I said to my husband "man I could really go for a really good donut right now" but we are a little low in the donut shops up here in the Hudson Valley. Sure we have Dunkin' Donuts but lets face it - they are not good donuts. Now I see this post and the craving is back!